“It’s hard thing to put into words, feelings. But I’m going to try. This business is always an adventure, full of travel and opportunities to tell stories. Usually as an actor, every few months, you travel to a new place, start a new project, build a new character, learn new rhythms, new inside jokes with your crew, make new friends. Until “Shameless” came into my life 8 years ago, I led that kind of transient wonderful life of an actor. And I never realized how much I actually craved the kind of continuity that this show has given me. And given all of us in the crew. Season after season I’m amazed that our same crew comes back. And it’s not just because it’s a wonderfully written, wonderfully layered show. There are these real connections, real friendships that bring us back season after season after season. See, in real life, unlike Fiona, I’m an only child. I never had a big family. Being ensconced in that messy Gallagher family love is something I’d always dreamed of. But even off set, it feels real. We’ve watched the kids grow up into the strong, talented, independent human beings that they are. I taught Emma to shave her legs. I was there when Ethan learned to drive. Shanola and Jeremy and Joan and Bill danced at my wedding in New York last year. Our fearless leader John Wells thankfully held Sam and me up on those rickety chairs during the hora. I’ve spent the Jewish holy days in temple with David Nevins and his wonderful wife and kids. It really feels like a family. This kind of stability, this family, has nurtured me and made feel safe enough to stretch and grow creatively. The way John Wells has shepherded me as an actress, and more recently how he’s encouraged me wholeheartedly as a director and a writer, has been an honor and a privilege. We have made over 100 hours of television. That’s no small feat. There’s a new study that says it takes 100 hours to become friends with someone. The Gallaghers have been in people’s living rooms for 100 hours. So, it makes sense. We can feel your connection to us, to these characters. In the airport, in restaurants, on the street, when people call out “Hi Fiona” “Oh my god, it’s Lip” or “Screw you Frank!”… it feels good. The opportunity to play Fiona has been a gift. There are few characters — female or otherwise — as layered and dynamic. She is a mother lion, fierce, flawed and sexually liberated. She is injured, vulnerable, but will never give up. She is living in an economic depression, but refuses to be depressed. She is resourceful. She is loyal. She is brave. I knew it the second I read the pilot script, this was different, this was special. I tirelessly prepped the audition with my coach Terry Knickerbocker. I walked to the appointment in the rain so I looked disheveled. During my third audition, when I got the part IN the room, I literally jumped up and down screaming in joyous relief and disbelief. Quite simply, the last eight years have been the best of my life. Malcolm Gladwell says it takes 10,000 hours to become truly good at something. To become world class. Well by my calculation, 100 episodes, 7 days per episode (plus Chicago weeks), 12 hour days, we’re just at about 10,000 hours. So I guess we’re finally good at this. I can say for certain that this cast and crew, who I’ve been have truly honored to work alongside, are world class. I am proud and I’m filled with gratitude. I know you will continue on without me, for now. There is much more Gallagher story to be told. I will always be rooting for my family. Try not to think of me as gone, just think of me as moving down the block. Season nine of Shameless will premiere on Sunday, September 9 and will feature the show’s 100th episode in week four. How do you feel about Rossum moving from the show? How do you hope her character will be written out? Share your thoughts in the comments! 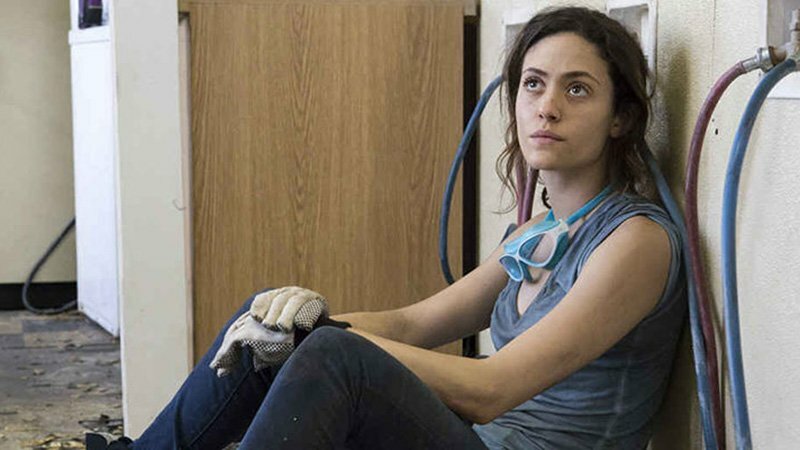 The post BREAKING: Emmy Rossum Announces She’s Leaving Shameless appeared first on ComingSoon.net.